Bathroom cleaning is one of those chores that homeowners dread — especially when it comes to cleaning the tub. The good news is, tub cleaning doesn’t have to be a difficult, time-consuming task. If you know the secrets, you can get this job done in less than 30 minutes. No shortcuts, either! Your tub will be sparkling clean like it is newly installed. Read on and learn what supplies you’ll need and how to clean your tub properly. These days, there are tons of bathtub cleaning products on the market and they all purport to achieve the same result: remove grease, lime and rust stains. Despite the proliferation of these types of products, plain dish soap stands out above the rest. Use a degreasing brand for the best results. You’ll also need something to scrub the tub. You can resort to a scrubbing sponge or a brush, but one of the problems with bathtub cleaning is the inevitable backache that comes with bending over the tub. Make scrubbing easier on yourself and use a sturdy broom, instead. Last, if your tub has glass doors, put some full-strength vinegar in a spray bottle and have a few cloths on hand to clean them. If your tub is cleaned regularly, then issues such as lime and rust stains won’t have a chance to build up over time. Most of the grime you’ll find inside a tub is a combination of soap scum and oil from your skin. That’s why degreasing dish soap works best to remove it. To start, run the water to moisten the bottom and sides of the tub, then let it drain. Once drained, pour a generous amount of dish soap in the bottom of the tub and use your brush or broom to spread it liberally over the entire tub. You’ll want to let this sit a little while, so that the soap has a chance to do its work. If your tub has glass doors, now is a good time to clean them. Simply use the full-strength vinegar to coat the doors. Let this sit a minute or two so that the vinegar dissolves any lime buildup, then use a dampened cloth to wipe the doors. Go back over the doors with a dry cloth to polish them to a streak-free shine. Now that the dish soap has had a chance to penetrate the layer of grime in the tub, use your brush or broom to start scrubbing. The buildup should come off easily. If you still have a few grimy spots, let the tub soak a bit longer. If the buildup in your tub is particularly tough, you may want to rinse the tub and coat it with fresh dish soap. Once the scrubbing is done, thoroughly rinse the tub. For this part, you can simply turn the showerhead on and let it run for a few minutes to remove all the dish soap. If you have a handheld sprayer, you can do the rinsing a bit faster and save water while you’re at it. Make sure to use hot water so that the tub dries quickly, without water spots left. How Often Should You Clean the Tub? In general, bathrooms should be cleaned weekly — especially fixtures such as the toilet and sink. However, because your tub gets a rinsing each time you use it, it’s safe to do this particular task once per month. If you have hard water, you may want to clean the tub a bit more often to prevent lime and soap scum buildup. Keep in mind that the more often you clean your tub, the less buildup there will be. Regular cleaning means less time and effort spent on this task each time you do it. With simple supplies and minimal effort, you’ll find it’s easy to keep your tub looking like new. There’s no need to spend lots of money on specialized cleaners when all you really need is a good degreasing soap. Most importantly, schedule bathtub cleaning regularly so that you can avoid a thick buildup of grime. When you wake up in the morning and walk into the bathroom, do you stumble over a pile of children’s clothing? Do you wish that they would just pick it up without you having to remind them every time? Are you a new parent who wonders how you can solve this before it starts? There are a few methods you can consider to remedy this inconvenience. Fortunately, none of them involve you doing all the bathroom cleaning yourself. The first issue that parents need to reckon with is a sense of obligation to someone else’s organizational design. All too often, people set up their homes in a way that doesn’t work for them, because they perceive that is how it is supposed to be done. As you go through the day, make observations about this particular obstacle. Ask the following questions: • What time do my kids usually bathe? • When do they often leave clothes on the floor? • What problems does this cause for me? Knowing the primary concern helps you determine the right solution. For example, children who drop their clean clothes on the floor and get them wet will have to find another outfit to wear. Kids who leave their dirty clothes on the floor after a bath need a place to put them. Improving bathroom storage as part of your organizing regimen is a little different than the rest of the house, simply because bathrooms are often smaller than other rooms. To solve the problem of clean clothes becoming dirty, add shelving, racks or hooks that allow your kids to set them neatly for use after they shower. For dirty clothes cluttering the floor, you might set aside space in your bathroom vanity for a small hamper. The goal with almost any organizational approach is to get as much as possible off the floor. Nowhere is this more important than the bathroom. After all, if your kids get into a water fight during bath-time and soak the floor, whatever storage bin you have for the clothing will also get wet. Carrying dripping clothes to the laundry room isn’t anyone’s idea of a good time. Prevent this from becoming your problem by investing in solutions located near the ground, which is ideal for very young children, without taking valuable floor space. Although a lot of people think of toddlers and preschoolers as too young to get into good bathroom cleaning habits, you might be surprised how early you can start. One of the first skills babies develop is that of grasping an item and moving it from one place to another. This means that your kids can help you pick up their clothes by as early as 12-18 months. Make sure they can easily get to the basket or hamper to put in their clothing, without your help if possible. If you can establish this practice early, you will capitalize on their desire to show off their skills, while teaching a good habit for the future. As your children get older, you may realize that they should know better than to leave their clothes on the floor. Why do they keep doing it, though? Sometimes, you have to change the way you look at the space — to make it work for them as well as it works for you. If your older kids or teenagers have their own bathroom, talk to them about the bathroom storage and design. They may want a shelf or cabinet exclusively for them, to store their hair products, body washes and other gear. If you can help them re-imagine the bathroom to suit their needs, they may respond naturally by keeping it cleaner. Remember the last time you tried to develop a new habit. It may have taken a few weeks to make it feel second-nature for you. This is also true for your kids. 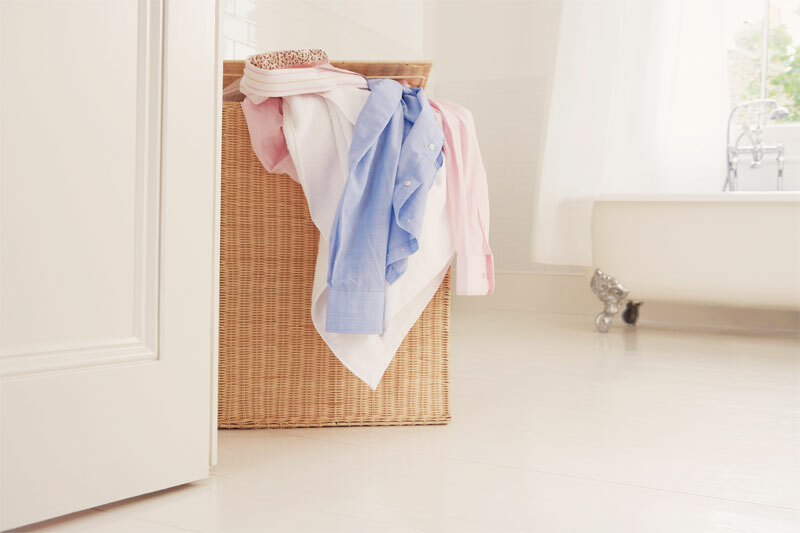 Once you set up a new system for organizing clothing in the bathroom, your kids might be eager to use it. After a week or so, you should prepare for a few slip-ups. Keep positive about the process, and maybe add a few incentives for kids who stick to the routine. Before long, they’ll be doing it without thinking. As with any good organizational habit, you might have to change tactics from time to time. When you pay attention to the reason your kids throw clothes on the bathroom floor, you can devise a solution that will minimize your bathroom cleaning obligations. As an added benefit, your bathroom will appear much tidier, which can decrease your stress and make your whole family happier! When it comes to bathroom design, one small change makes a huge difference. Infuse fun functionality into any space with these awesome bathroom accessories. One thing is for sure: Americans love their lavatories. Some say the kitchen is the heart of the home, but we say the bathroom is the backbone. It’s where the day ends and begins — but from a design standpoint, it’s also an oft-overlooked space. Toss a pretty rug on the floor, and most folks call it a day. Why do so many interior designers shy away from sinks, showers, toilets and the like? Maybe bathroom renovations aren’t as romantic as bedrooms or kitchens, but they allow you to create a profound statement. Adding some quality bathroom accessories can make all the difference in a relatively small space. Installing a luxury vanity or stunning antique tub is a decent start, but it’s not enough to achieve that “wow” factor that every homeowner desires. If you’re looking to spruce up a recently renovated bathroom, consider integrating some cool accessories and unexpected fixtures. We’ve assembled a solid lineup of today’s most sought-after “extras” for bathrooms of every size. Some items are cheap, some expensive — but they all deliver on the promise of personality, functionality and organization. Yes, these sound machines have been around for decades — but with huge advances in wireless technology, today’s shower speakers go far beyond your father’s staticky FM station. Connect to any smart device via Bluetooth, and you can listen to playlists, daily podcasts, audio books and so much more. Built-in microphones also allow you to answer calls while the water is still streaming. When staging a home, designers often drape cozy blankets over the sofa or plush pillows on the bed. Why should our bathtubs go bare? A bamboo bath caddy brings rustic warmth to an otherwise stark, shiny space. Plus, when you finally get around to indulging in a nice soak session, the tray adjusts across the length of the tub to hold your book, iPad, phone, candles, wine glass and more. Whether you prefer antique charm or sleek, contemporary finishes, nobody can deny the amazing convenience of an automatic soap dispenser. It seems so trivial. So lazy. Yet once you say goodbye to the manual pump, you’ll wonder why you didn’t switch sooner. For homeowners with big families or constant guests, it’s also a smart way to prevent the spread of germs. If you’re a female short on space, blow dryers, curling irons and straighteners are the bane of your existence. Stray wires and wands create an immediate eyesore. Thankfully, hairdressers banded together to invent an organizational masterpiece in the hair styling station. This funky-shaped storage unit features heat-resistant stainless steel and holes perfectly molded for today’s popular styling tools. Not to mention, it looks pretty chic sitting on your counter. Hard water, anyone? If you have a stylish mirror or pretty glass to display your intricate tile work, then you probably know the difficulty of dealing with hard water, soap scum and other everyday deposits. Grab a couple silicone squeegees, hang them from a suction cup hook, and behold their charming pop of color (and functionality). Just swipe the blade across any flat surface, and see it sparkle and shine. If you’re unwilling to splurge on heated floors, then impress clients and guests with a heated bath mat. It’s the simple things in life that warm the heart and excite the senses. Today’s high-tech rugs are completely rechargeable, machine-washable and stay piping hot for hours — the perfect marriage of convenience and spa indulgence. Ever see those little lights that illuminate your toilet at night? We love those, too — but this other unique gadget really makes a splash. Now, you can purchase an LED disc to replace your existing faucet screen. Once you screw it in with the appropriate adapter, water streams out alongside a colorful disco light show! If you love the glam of an old Hollywood vanity, today’s makeup organizers are the next best option. Transform any woman’s countertop into a stunning display — thanks to exceptional craftsmanship; white, easy-clean design; and a nook and cranny for all of today’s popular cosmetics. There’s something so inherently awkward about a bathroom wastebasket. Now, there’s no more bending over to lift the lid or slamming your foot to pop it open. Innovative smart trashcans feature built-in chips that automatically sense your presence. The lid opens and closes silently, startling (and impressing) visitors as they pass by. It’s a miracle from the bathroom gods! If you hate cleaning all those impossible crevices throughout the bathroom, meet this floor-mopping masterpiece. iRobot Braava is a miniature version of the famous roaming vacuum. Designed specifically for compact spaces, it jet sprays between tile, at the base of the toilet, and in other hard-to-reach spots. Ready to bring your bathroom projects into the 21st century? Give these gadgets a try, and see how well they complement your Modern Bathroom accessories, vanities, fixtures and other luxury essentials! They say kitchens sell houses, and that may be true to a certain extent, but there is one room in your home that will get more attention than any other space — your bathroom. Of course, everybody needs to sleep, but they can do that on the couch, in the bed, or on the floor. Everybody needs to eat, but today, that can happen in the living room or in the back seat of your car if you're busy with after-school activities. One thing will always remain the same: Your porcelain throne is a place where you can make peace with life, no matter how hectic it gets outside your bathroom walls. It doesn't matter if you're entertaining guests or fulfilling the missions of your bathroom space — when it comes down to it, someone who enters those walls will be looking for a little downtime. • Humor There's an entire world of words ready to be read while you're sitting on the John with these books! Nobody questions toilet paper's importance, but this book enables you to turn it from a functional product of design to a work of art. Each perforated piece can take on a new look, once you figure out where the folds go. It's perfect for the bathroom for obvious reasons — it uses the room's No. 1 element to provide time-passing art instructions. Simply pull off a few squares, follow the directions, and leave a fun little paper boat on the back of the toilet to greet the next person who needs to use the facilities. It's a great way to leave a little something behind without making a lot of enemies in your house! Written by a medical doctor, and backed by science, this book has a humorous approach to an activity we all do. Chances are, you're not going to take this book to your office or read it in the cafeteria during your lunch break. That's not to say it shouldn't be read, however! “What's Your Poo Telling You?” has found its home in bathrooms across the country. It's the perfect place to learn what makes your body tick, and why the result of that ticking looks and feels the way it does. Get ready to giggle a little because this book has a weird take on the twisting and turning organs inside your body. What do you think your poo is telling you? Here's a humorous way to find out! OK, this may not be a book, per se, but you'd probably be surprised about how many people suddenly become science freaks when they're sitting on the throne. Perhaps people may never understand why the ancient pyramids in Egypt and poo time are perfect accompaniments to each other. We may never know why weird insects get so interesting when your intestines need to clean themselves. Test the theory by putting a small stack of Nat Geo in your loo, and listen for someone in your house to tell you about some intriguing information they've recently read. Feeling a little adventurous? This book will give you insight into some of the most unbelievable spots on the planet. If you're ready to get out of your shell and plan a vacation you won't soon forget, “100 Wonders of the World” can get your mind going. If you have your phone close by, you may even be tempted to start looking up hotel and flight prices. After all, this would be the ultimate way to multitask! When it comes to your porcelain palace, the smallest details can make the biggest difference. This is a room where accessories really matter. A single piece of hardware can change the entire look and feel. Lighting can change your lavatory from a place you have to visit to a room you don't want to leave. 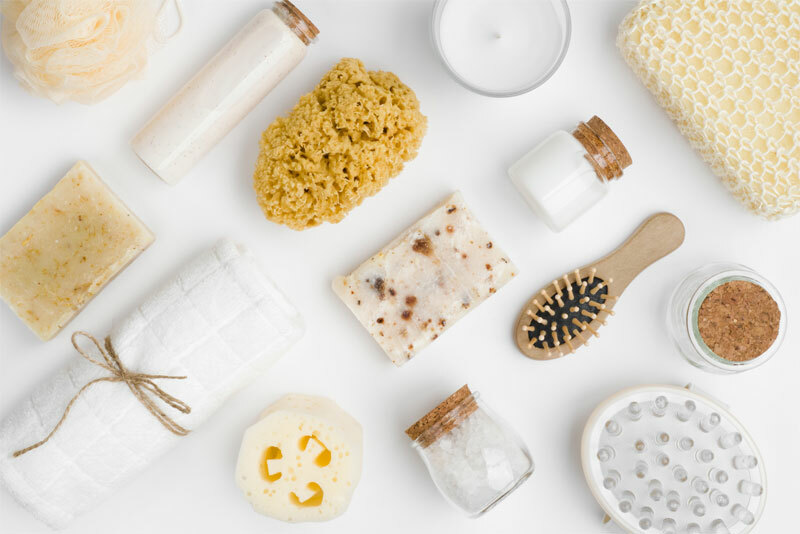 At Modern Bathroom, we know how to do bathroom accessories right. From stunning vanities to high-quality plumbing supplies, we've got you covered. We invite you to browse our selection of bathroom accessories today. Ordering online is simple! While it's possible to give your dog a bath in a standard tub or a typical shower stall, it's not always ideal. It may not be spacious enough for you and your pet, and it might not be the safest choice. Soaking tubs are one option to consider when creating a dog-washing station in your home. These tubs are large and deep, but the faucet is on the backside of the tub rather than in the front. This makes it easier for you to wash your pet, and may help your dog feel more secure. If a soaking tub is not a possibility, a shower with a secure base is another option that may work well. Once you have completed your renovations, store all of the necessary safety items nearby the dog-washing area. This may include a leash, which can help keep your dog calm while also giving you more control during the bath. You also should have a mat in place to prevent your pet from slipping during the bath. When you have a dog-washing space in your home, be sure to maintain it properly and keep it clean. Dog hair will quickly clog your tub and may create eventual plumbing issues for you. To prevent this, take the time to brush your dog in a separate area prior to beginning the bath. Choose a brush that will work best for your dog's particular coat. Remember that regular brushing is critical to minimizing mats and keeping your dog looking fresh and clean. Sometimes, baths can be stressful for your pet. Keep comfort items near the bathing station, such as a favorite toy or a special blanket. Any way you can help your dog stay calm will benefit both of you. One common mistake that pet parents make is using human shampoo products and lotions. These bathing products are not designed for dogs, and may be detrimental to their skin or coat. When you create a dog-washing station, be sure to stock the cabinets with dog shampoo products. These will allow you to gently wash your pet with a product that’s safe for its skin and coat. Other supplies that you may want to store in your nearby cabinets include dog nail trimmers, a pet-safe hair dryer, and pet conditioners. Bath time can be about more than eliminating the day's dirt and getting clean for another adventure. It's a wonderful time to play with your precious pup. Take out special toys that your dog can only enjoy during bath time. Practice new commands and reward your dog when it behaves during the bath. 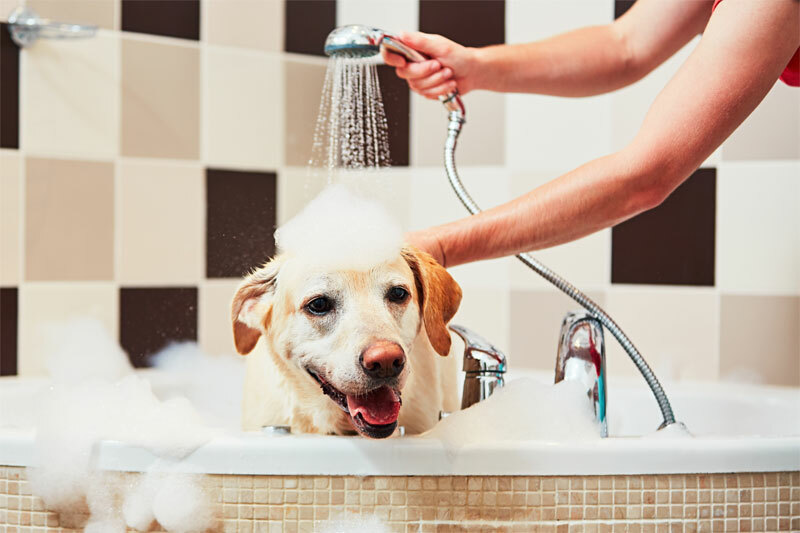 By playing during the bath, your dog will not only have fun, but it also could begin to feel less anxiety about being bathed. Playtime can change your pet’s perception of the experience, while simultaneously giving you time to bond. After the bath is finished, work quickly to get your dog warm and comfortable again. Stacking fresh, warm towels nearby the dog-washing station will help your four-legged friend be dry and cozy within moments. It's often ideal to have two towels nearby — one for the initial moments after the bath and another to thoroughly dry your dog after it is no longer dripping wet. Your pet is an important member of your family, so it's essential to make your pup feel at home at all times. A dog-washing station within your dwelling will not only be convenient, but it will be a space where your pet can feel comfortable and confident during its baths.